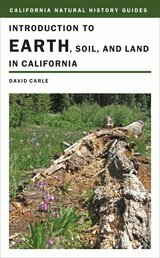 Following his acclaimed guides to air, fire, and water, David Carle now offers a fascinating exploration of one more primary element of the natural world—the land beneath our feet. From earthworms and earthquakes to Earth Day, this concise, engaging guide is a multifaceted primer on the literal foundation of California’s environment. Carle tells how soil ecosystems function, discusses what lives in the soil, and examines various soil types. He then turns to the relationship between humans and the land, and investigates the various uses and abuses that land in California endures: large scale agriculture, mining, and development, as well as fires, floods, and erosion. The guide also details the history of land use in the state, making it an essential resource for understanding our total reliance on soil, the marvelous substrate that is the basis of life.